My contribution to Cyphers and Masks is the Spy Backgrounds and Spy Campaigns sections. The Spy Backgrounds section gives players (and GMs) ideas as to what job or lifestyle helped them to become effective agents. Things like freerunners, law enforcement, performer, and a few other unusual but interesting options. 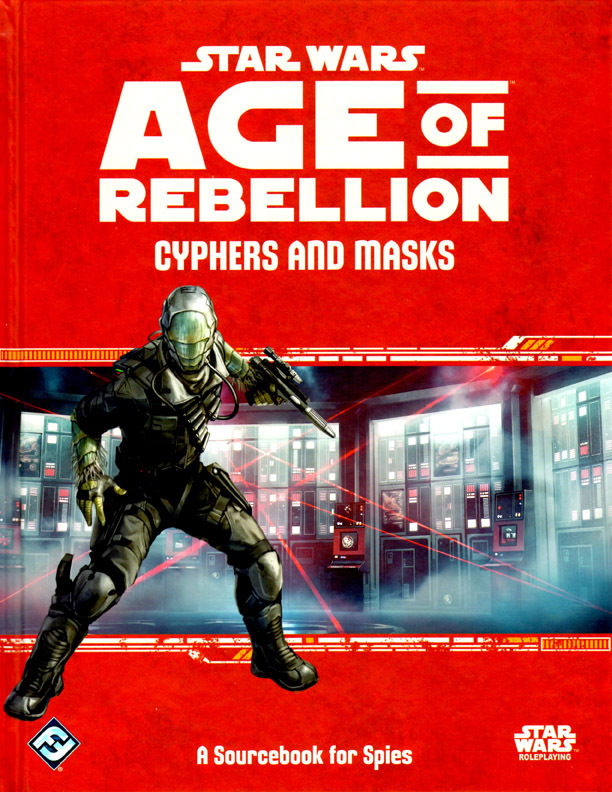 The three campaigns gives the GM ideas and outlines different elements of espionage stories: one focuses on a single target, one sets up a larger scale sleeper cell operation on the planet Duro, and the third puts the PCs in the heart of a complex diversion of Imperial goods to Rebels, right under the Imperial's noses. The Covert Ops section is one of the most interesting, and useful beyond just espionage adventures. The section presents new ways to use certain skills and recommendations for spending narrative dice icons (advantage, despair, etc.). Computers, Deception, Skulduggery, and Stealth are all covered. Fantasy Flight has a new preview of the book here, and the Specialization Decks are now available.